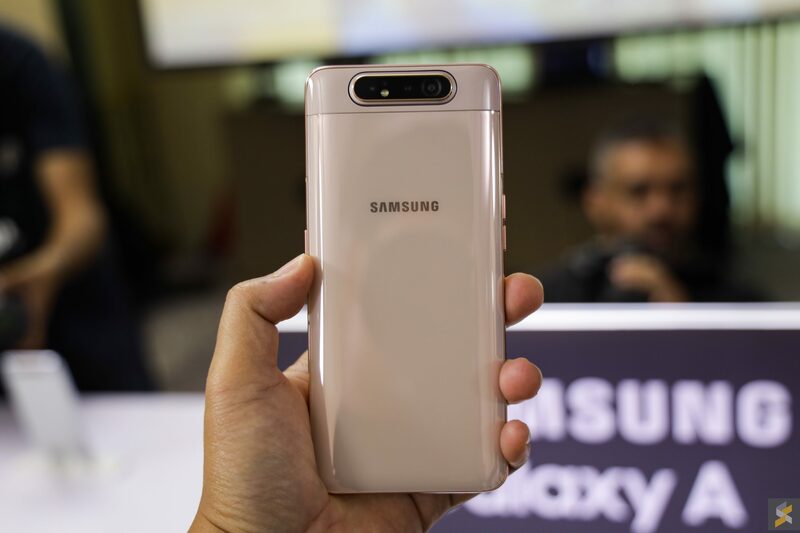 Samsung is really going big with its new Galaxy A series. 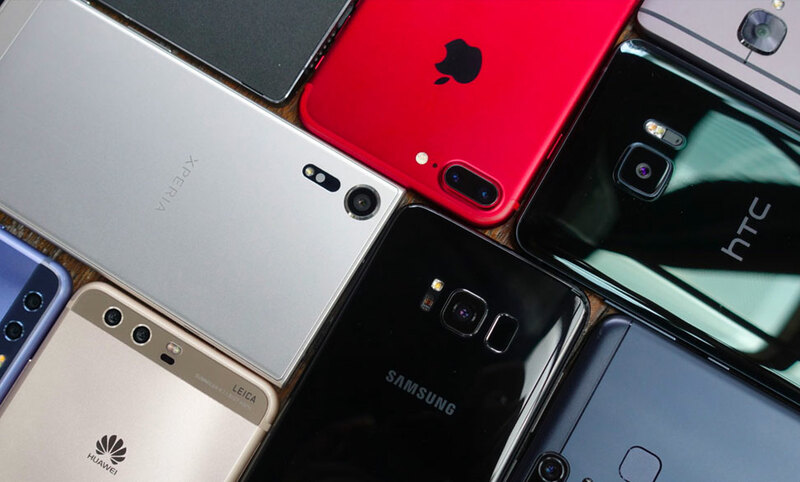 From what we’ve seen so far, they offer a large display, a huge battery and a couple of flagship features while maintaining a rather affordable price tag. 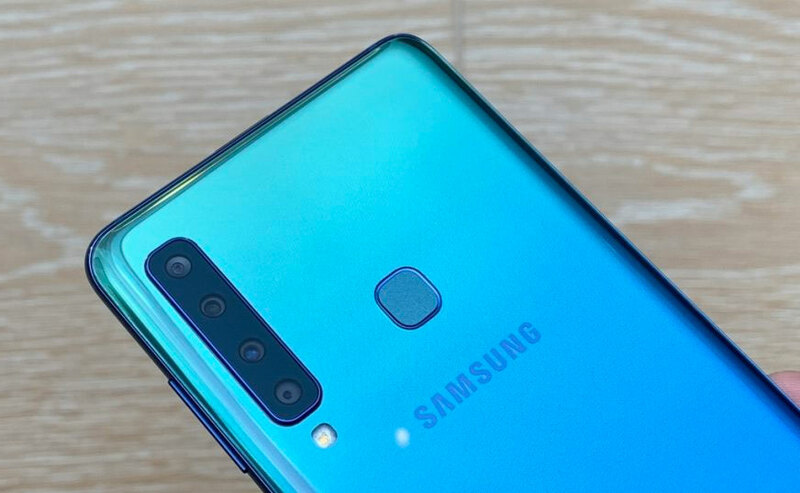 With the Galaxy A80, this is a very different smartphone. Firstly, let’s talk about the display. 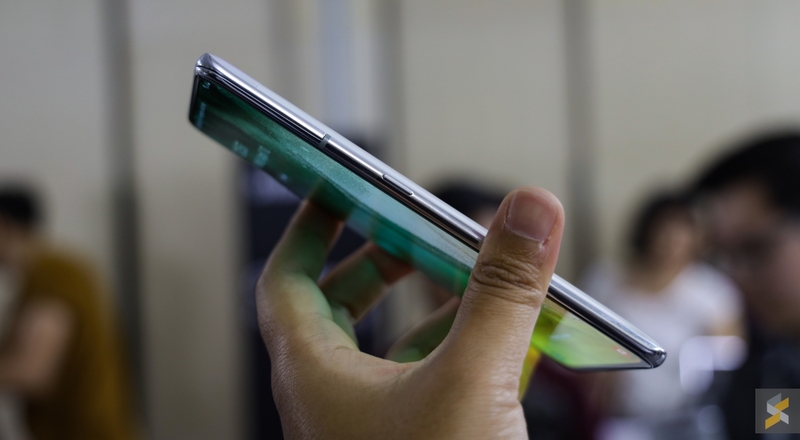 It has a massive 6.7” Full HD+ Super AMOLED screen. Samsung is calling this the New Infinity Display and there are no notches or punch-holes at the top, which gives you a more immersive viewing experience. 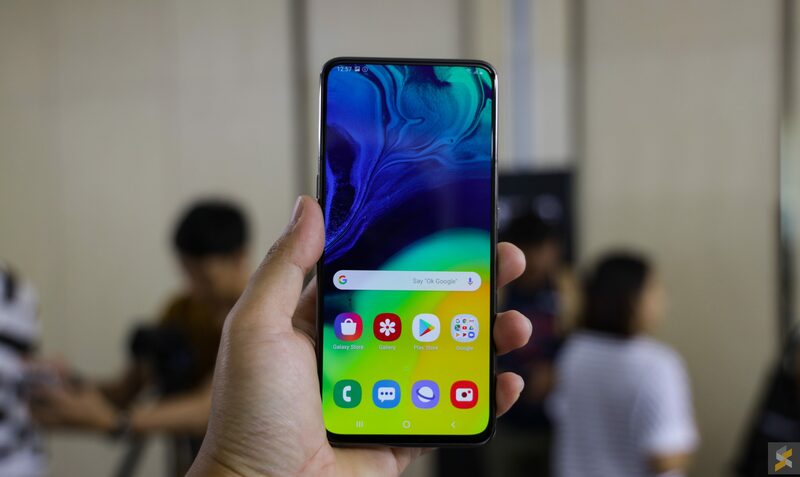 Similar to the Galaxy A50, it also has an optical in-display fingerprint sensor. 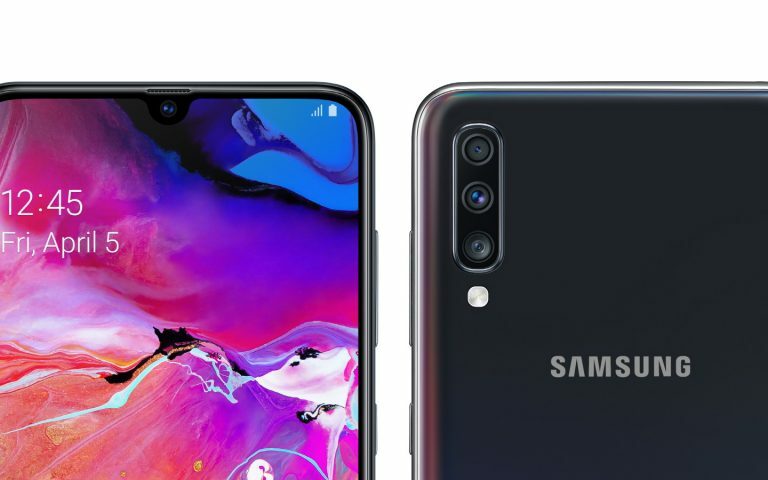 The Galaxy A80 doesn’t even have a traditional earpiece speaker at the top and if you’re using this phone for voice calls, the sound is generated from right underneath the screen. This is similar to the piezoelectric speaker which was used on the Xiaomi Mi MIX or the new Huawei P30 Pro. The biggest highlight of course is the rotating camera module. At first glance, it looks like a combination of the OPPO Find X and the OPPO N3. By default, the cameras are facing to the back and you can use it instantly like a normal smartphone. 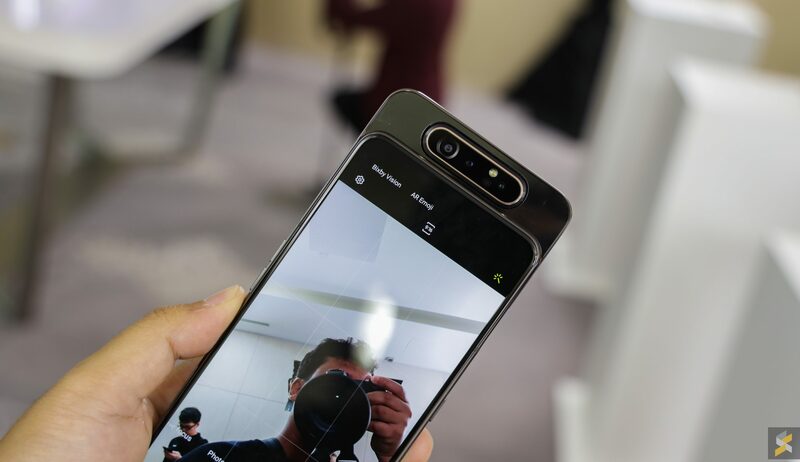 It’s only when you switch to selfie mode, the whole module slides up and the triple-camera array is then rotated to the front. So essentially, this means you’re using the best cameras for both selfie and normal shots. 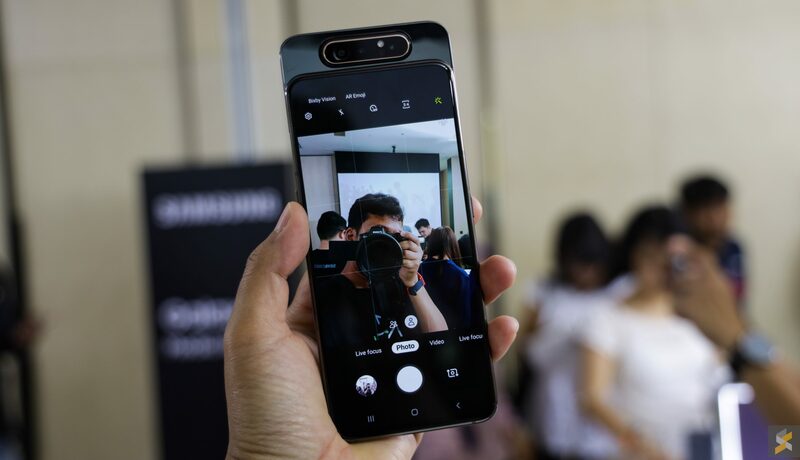 In terms of camera specs, the A80 has a 48MP f/2.0 main camera, an 8MP f/2.2 ultra-wide-angle lens and the third shooter is a 3D depth camera. 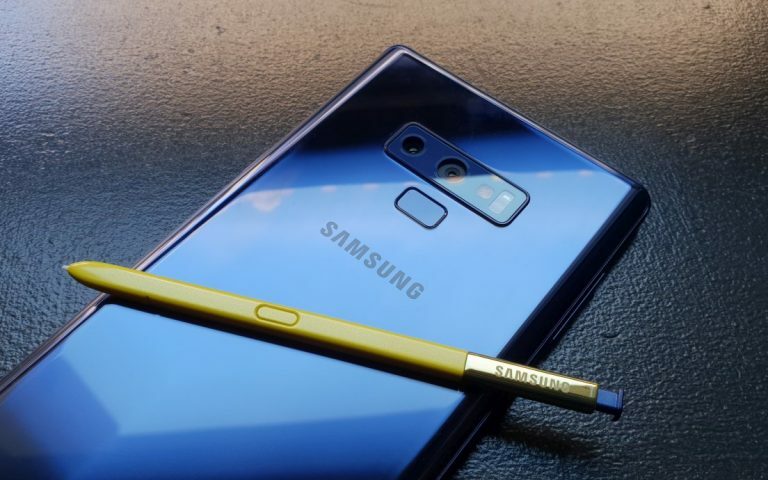 According to Samsung, the 3D depth camera collects depth information more accurately and this will give you better bokeh effects for portrait shots. Another new feature we noticed is Live Focus video, so you can take a selfie video of yourself while having a blurred background. Unlike the OPPO N3, you can’t manually set the angle for this rotating camera. So you can only use it in two states – Back or front. At the time of shooting, Samsung hasn’t provide any durability figures for the camera module. We did try to force the camera and it does retract automatically if it’s used incorrectly. This is somewhat similar to the Oppo Find X. 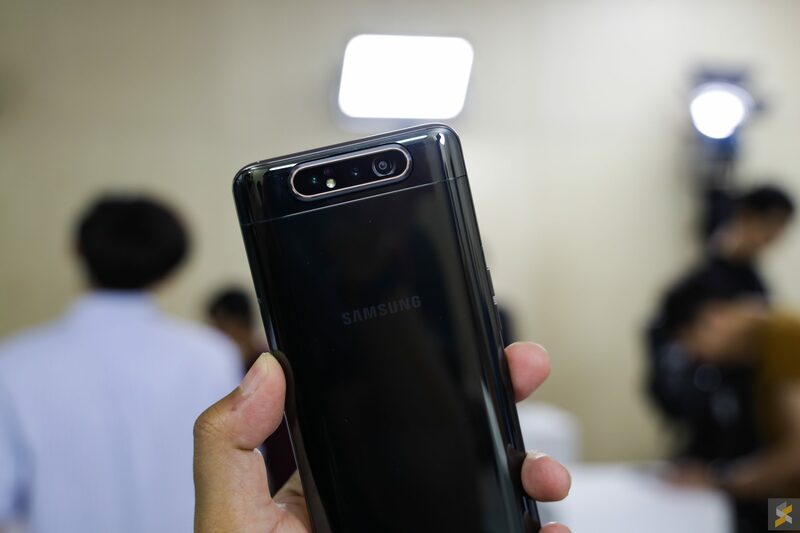 In terms of hardware, this is the most powerful smartphone in the Galaxy A series. Under the hood, it runs on a Qualcomm Snapdragon 730G processor with 8GB of RAM and 128GB of storage. 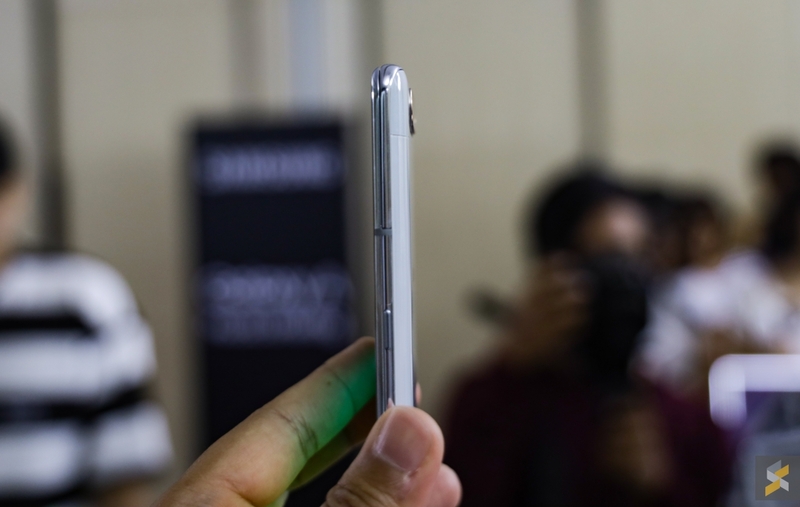 While the Galaxy A series is all about big, the battery is actually slightly smaller at 3,700mAh. Fortunately, it has a newer super-fast charge technology that pushes 25W via USB-C. This is better than what you get on the Galaxy S series that has 15W charger. 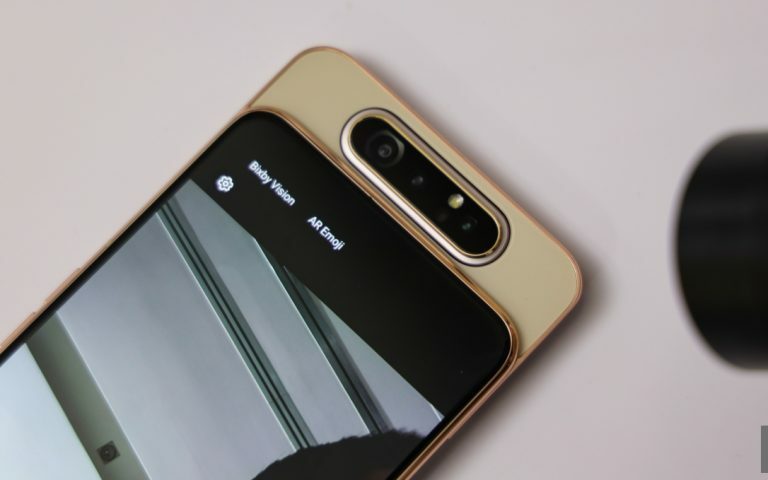 There’s a couple of things that I didn’t like on the Galaxy A80. It doesn’t have a 3.5mm headphone jack and this is the only Galaxy A model at the moment that has no microSD card expansion. For a phone that puts immersive viewing experience as a feature, I would have liked it if it has a pair of stereo speakers. Since it has a huge 6.7” display, we would have expected it to come with at least 4,000mAh a battery but perhaps the new 8nm processor is frugal enough to push the A80 to last a full day. 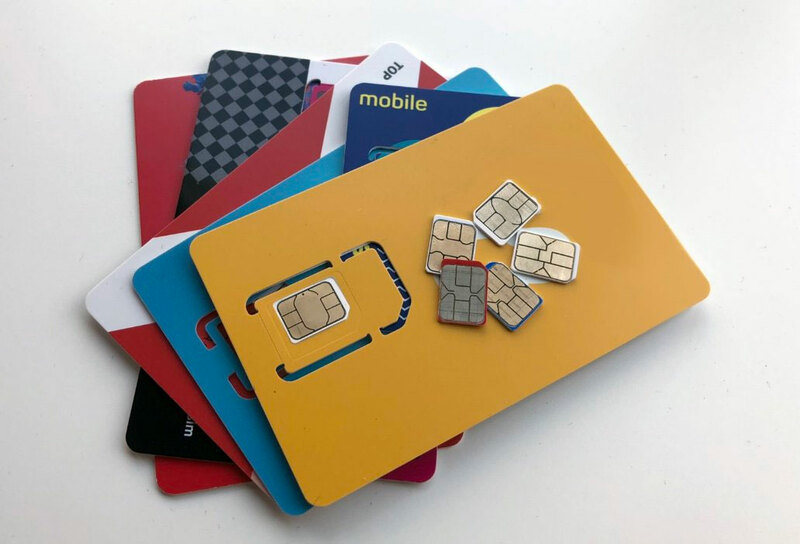 That said, a nice touch is that it does come with NFC and we’re told that it will support Samsung Pay when it comes to Malaysia. In the hands, the Galaxy A80 feels premium with its glass and metal construction. It has a significant weight to it which makes it feels expensive when you’re holding it. We still don’t know what’s the price at the moment but we’re told that it’s coming to Malaysia sometime end of May or early June. 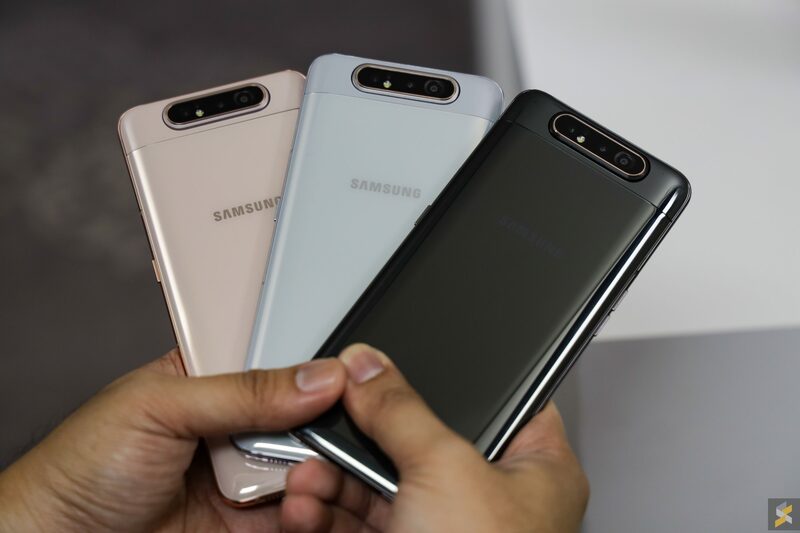 The Galaxy A80 comes in three colours – Ghost White, Angel Gold and Phantom Black. 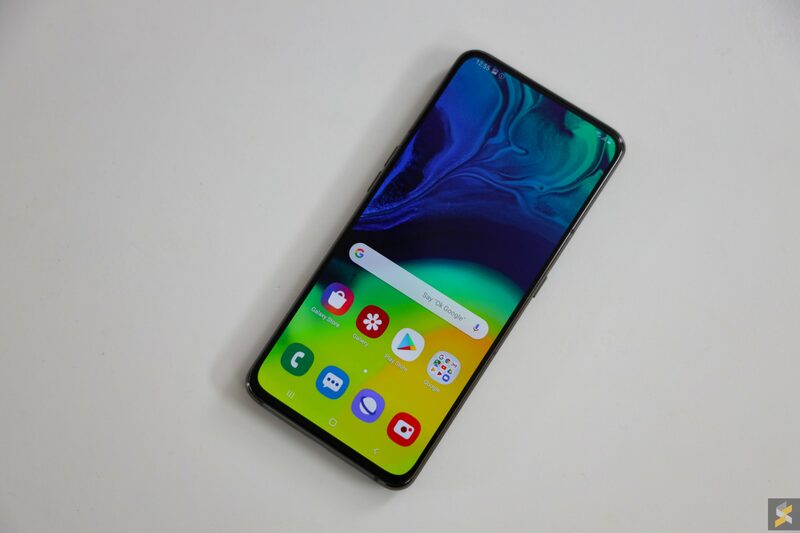 Overall, the Galaxy A80 is quite an interesting device and honestly, I didn’t expect to see a phone like this to be coming from Samsung. 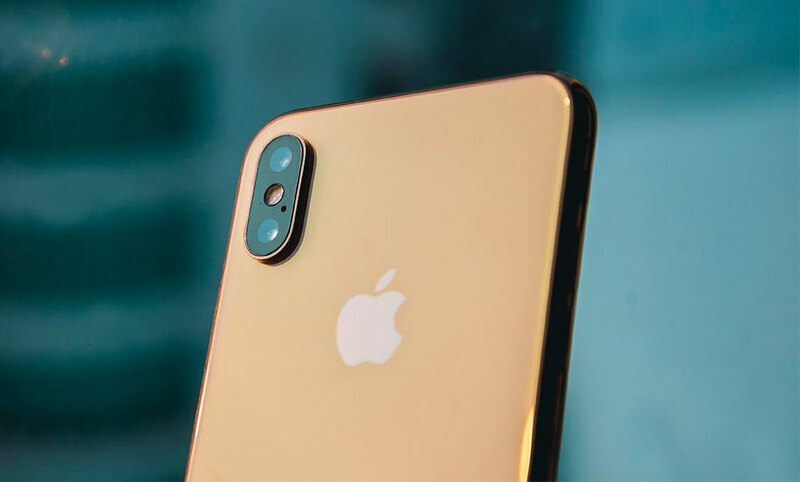 For those who are looking for a smartphone that has a large screen, a powerful processor, a high-resolution 48MP camera that can rotate and if you are fine with its shortcomings, this could be the device for you. What do you think? Let us know in the comments below.